Linking up with: Shadow shot Sunday. I love this because I can't quite untangle it. I drove on a road that looked kind of like this yesterday. They were making repairs and the black top was wavy all over. Of course I had to snap a photo through the window. Nice shadows – the branches of the trees seem to be live around the framework. There seems to be many a bough that are moving like arms in order to catch something, anything on the ground – perhaps a photographer? Kind of like the mean trees in the 1937 classic Snow White that were chasing after the movie's heroine. Shadows add quite an allure to any scene! Beautiful photo. 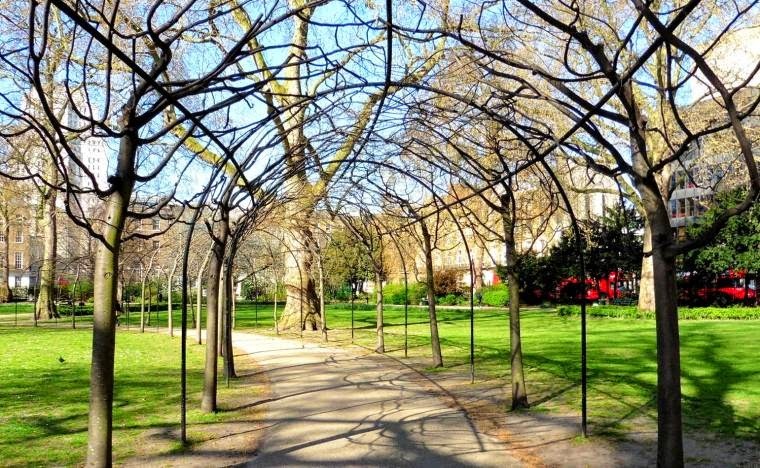 I want to take a stroll under this arbor. It's lovely now, but I can also imagine it with the trees fully leafed out.My Saturday Snapshot post is HERE. Amazing shot! Sparks the imagination! That is a beautiful shot! I'd love to spend some time there. I bet that is stunning in the summer filled with greenery and flowers! Love the image. Love the quote!